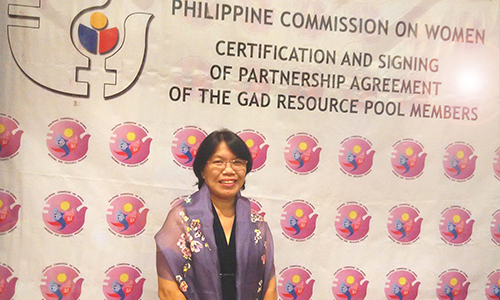 Dr. Jocelyn Du-Tuscano, the University GAD Focal Prson is now an accredited Resource Pool Member of the Philippine Commission on Women (PCW) under the National GAD Resource Program, the PCW is thea lead agency in charge with the implementation of Gender Mainstreaming efforts and other gender-related policies in the country. The Accreditation was signed by Atty. Shemidah Gigantone-Cadiz, Head of GAD-Focal Point System, Technical Working Group (TWG) of the PCW on July 6, 2017. As a certified PCW Resource Pool, Tuscano is capacitated to provide Technical Assistant such as seminars, lecturers and trainings along Gender Sensitivity Trainings (GSTs), Gender Analysis and GAD Plan and Budget among the various agencies throughout the country. Tuscano has been the University GAD Focal Person since the establishment of the CSU GAD Office in 2012 and is a full fledge professor VI of the university.